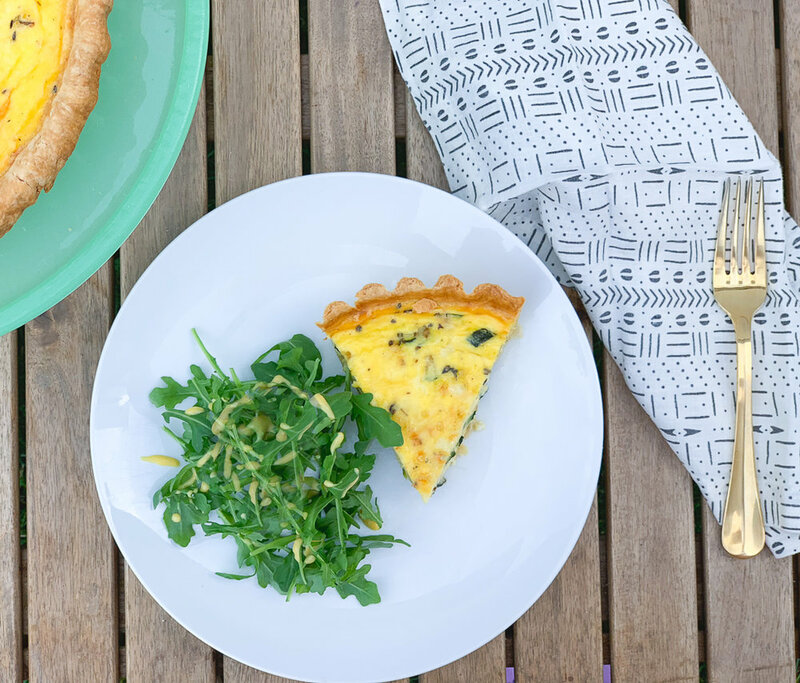 This quiche recipe has been such an evolving recipe for me. From my first few months in culinary school to now, I have been tweaking and testing this recipe and I’ve finally found the perfect balance that works for me, every time. I made this particular recipe with simple vegetarian ingredients but I also love a bacon and spinach quiche or a corn and leek variety. The trick is getting the egg to cream ratio nailed down and then you can add whatever filling you like. Make the Short Crust Pastry. In a bowl, combine the flour and salt. Add in the butter. It must be cold and cut into cubes. Combine until the mixture feels like thick sand. Add in a beaten egg and the cold water. The mixture should come together like a ball of dough. Adjust with an additional tablespoon of water if necessary. Flatten out the dough and make into a thick disk, wrap with plastic wrap and refrigerate for at least one hour. Prepare the quiche pan. Spray with oil, coat with flour, tap out excess flour and set aside. Combine 6 eggs, 3 yolks, 1/2 teaspoon of salt, 1 pinch of nutmeg, 1 pinch of black pepper, plus the 1 1/2 cups of Half & Half. Strain the mixture and set aside. Roll out the dough on a floured countertop and make a thin, equal, disk. Lay the dough over the floured quiche dish and form. 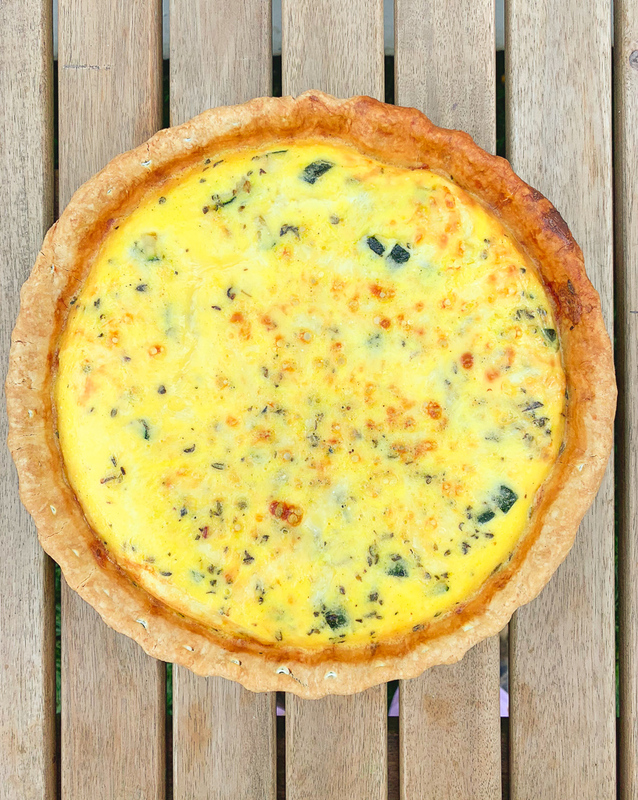 Use a blind baking tool or use parchment paper and pie weights to fill in the empty space of the quiche shell. Blind bake for 25 minutes or until the pastry begins to bake. Once out of the oven place the sautéed zucchini and cheese inside of the quiche shell. Fill the remainder with the egg mixture. Top with a sprinkle of gruyere and salt. Bake at 375 degrees for 1 hour or until the center of the quiche is cooked through, not loose and jiggly. The crust should be a golden brown. Serve and enjoy with a simple side of greens for breakfast, lunch or brunch.